My last visit to Fring’s was shortly after it opened. After hearing all the hype about the restaurant, I had to experience it in person, secretly hoping to get a glimpse of Drake. Since that first weeknight visit was so busy and loud, I readied myself for a night of drinking and music. Strangely, this return Friday visit was much quieter: we were seated at the bar (surrounding areas had some empty tables) and there was no live performance. Alas, there was still no Drake. The menu has completely changed and now offers more items. Arriving as crispy golden spheres, the crab cakes ($24) were delicious with plenty of lump crab meat and not much other filler. The sweet seafood was the dominant taste with an herby tomatillo verde and cooling sour cream for contrast. 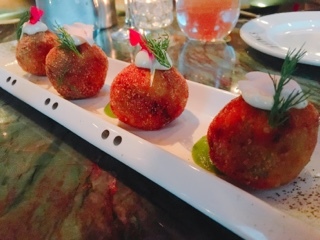 It’s a great starter to share or something to nibble on even if you're there just for drinks. In fact, they have a few good options for sharing. 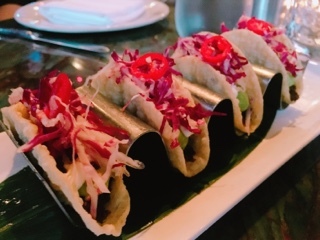 The beef short rib tacos ($16) also arrive four to an order and incorporate a fair amount of juicy tender beef held in a crispy wonton shell. Unlike other tacos that tend to be messy, Fring’s was easier to devour as it relied less on sauces for flavouring and more on ingredients like creamy avocado, spicy mango pineapple salsa, sour cream, and a slice of red chili. 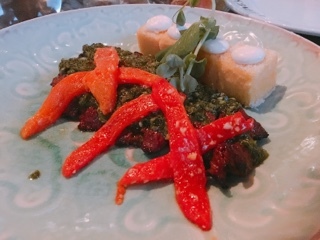 While the actual grilled skirt steak ($28) was merely decent – unfortunately, the meat was overdone and the flavours somewhat covered by the chimichurri and thick slices of red pepper - the accompanying Parmesan polenta “croutons” were delectable like a traditional crispy polenta but much creamier and cheesier. 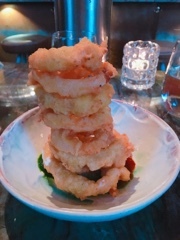 We had added a side of quinoa crusted onion rings ($10), thinking they’d go great with the steak. At first glance, they looked good – plenty of crispy crust and not overly oily. Then when you bite in and are met with the mealy tasteless crust, the perception changes. When I slathered enough chilli mint yogurt chutney on the onion ring it was a bit better, too bad there was so little of the condiment. Note to self: quinoa and onion rings do not mix. Thankfully, the tried and true roasted Brussels sprouts ($12) didn’t disappoint. There was enough bacon to make it sinful while still keeping the dish predominantly vegetables, the pearl onions providing a bit of sweetness, and to cut through the typical sweet maple glaze was a generous sprinkle of fresh thyme. One dish that just wouldn’t arrive was the grilled octopus ($26). 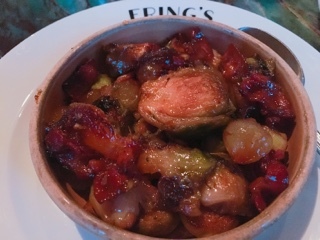 Unlike my previous dinner experience at Fring’s, our waitress kept an eye on the dish, coming by to provide us with updates. 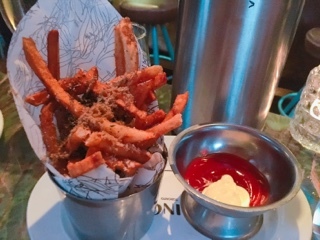 In the meantime, she provided complimentary truffle fries ($20) and another order of crab cakes (likely from hearing our moans of deliciousness) to keep us placated. Upon receiving the fries, I realized why a side of spuds would cost $20. In lieu of truffle oil, the chefs dust on real black truffles instead. Along with the Parmesan cheese, it makes for flavourful fries! 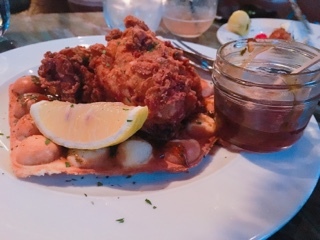 In the end, we decided to replace the octopus with fried chicken and waffles ($26); plate after plate kept whizzing by so they seemed popular and looked tasty. Although the chicken were pieces of boneless chicken breast, they were still tender; the batter spiced enough for taste, but could still handle the sweet and spicy maple syrup glaze. The Hong Kong egg waffle was cold and soft, not terrible but definitely doesn’t do the accompaniment justice. Note to restaurants: if you’re going to use the bubble waffle, these need to be made-to-order as it really doesn’t lend itself to sitting around. 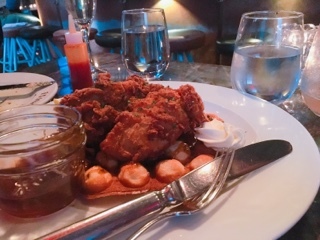 As a nice gesture, due to the long wait for the octopus, Fring’s also gave us the replacement chicken and waffles on a complimentary basis. Needless to say, we left terribly full (the walk back to a car a welcomed exercise to help start digest the mass of food), since the one octopus dish was replaced with three heavier items. Compared to the first dinner, service has improved – staff were more attentive and there were no delays at clearing dirty dishes. Of course, due to waiting around for the octopus, dinner wasn’t a shorter affair (the meal still lasted three hours), but on a weekend I don’t mind hanging out over another drink … with or without Drake.